On-water Fun just got Bigger. Tired of the same old company outing? 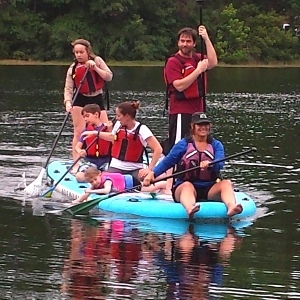 Treat your employees to some Mega SUP fun and a truly memorable day together. We have developed team building, corporate activities, staff rewards and client entertainment for some of the country’s largest companies. Our Mega SUPs are one-size-fits-all Family Fun for all ages! No experience is required to have a blast on a Mega SUP. Designed for up to 8-adult paddlers (a 1,400-lb weight capacity! ), these Mega SUPs have room for the entire familly — and a picnic lunch. So Many Beautiful Places To Paddle. If you’re looking for a little bit of adventure and a whole lot of fun, or just an opportunity to escape the grind and enjoy a little sunshine, fresh air and wide-open spaces, we have your cure. Adventures Up The Creek now offers professionally Guided Mega SUP Paddle Board Tours on some of the most iconic and picturesque waterways in St Marys, Georgia, Jacksonville and Amelia Island, Florida. Peaceful black-water creeks, beautiful salt marshes and adventurous island-hopping can all be found within minutes of Amelia Island and Jacksonville. 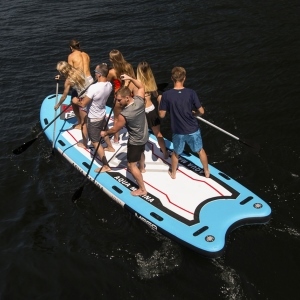 Mega SUPs (Giant Stand Up Paddle Boards) are perfect for any event or team building activity. They build connection and really bring out the fun in people! for as little as $45.00 — $65.00 / person. Gather Friends and Family for a Relaxing Day on the Water. Enjoy Scenic Views, Wildlife or a Floating Picnic. Our 20+ years of experience allows us to take your group to the out-of-the-way places very few people ever see and create positive and lasting memories of exciting adventures. Our Mega SUPs are definitely a bucket list Adventure! It’s Easy to Book one of our designed-for-you Stand Up Paddle Board Adventures Today. For those who love the outdoors, paddling the rivers and marshes of Coastal Georgia and Florida is a little slice of heaven on Earth. We strive to have each customer leave with a lasting memory of an amazing experience. We have had the honor of introducing people of all ages and abilities to the natural wonders of paddling. All that’s required on your part is an adventurous spirit and openness to experiencing new things. Get Your Adventure Started Now! Our 18ft x 5ft Mega SUPs are big enough and stable enough that the entire family can play along. You can Relax knowing we’ve been at this paddling thing for over 20-Years. You will be in safe hands with our highly skilled, experienced and well qualified guides to lead you through on your Mega SUP – Group Stand Up Paddle Boarding Adventure. You don’t have to waste any more time searching, when you can start planning your on-water adventure today! Open Bookings: Most of our ½-day Guided Tours are $45.00 — $65.00 / person. Full-day trips start at $75.00 / person. Private/Exclusive group tours and/or Specialized trips range from $55.00 — $125 / person. If you’ve been thinking about trying a Stand Up Paddle Board in Jacksonville, Amelia Island or Coastal (St Marys) GA, then there’s no better way to SUP with a group than our giant, multi-person Mega SUPs! It would be our great joy to take you paddle boarding on our Mega SUPs.